Read FBC Review of "Raven: Blood Eye"
INTRODUCTION: In recent times there have been a resurgence in Viking historical fiction and even non-fiction with several ongoing series and a pretty decent reference book by Robert Ferguson. I tried several such series, but none impressed me except the "Raven" one, of which I read and reviewed the debut last year on publication, while based on that, I included the second volume in my 2010 Anticipated Books list with pretty high expectations. On receiving "Raven:Sons of Thunder", I decided to reread first "Raven:Blood Eye" and I was even more impressed with it since I realized how the Viking world created there was immersive and pitch perfect. And "Sons of Thunder" just picks up where "Blood Eye" ends and continues the same page turning style of adventure, following Jarl Sigurd and his companions of whom Raven is starting to assume a central role. FORMAT/CLASSIFICATION: “Raven: Sons of Thunder” stands at about 340 pages divided into numbered chapters. The novel opens with a historical note about the Vikings, a map, a list of characters and a short prologue that continues Raven's narration in old age from the previous volume. The story is told in the first-person present tense except for the prologue and epilogue interludes. “Raven: Sons of Thunder” is self-contained bringing its main thread to a reasonable close, but the story will be continued with the destination very exciting, but I will leave to you to find out where! 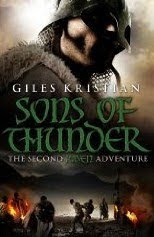 February 26, 2010 marked the UK Hardcover publication of “Raven: Sons of Thunder” via Bantam UK. Adventure historical fiction with possible supernatural elements and no flinching or avoiding the darker, blood and guts elements inherent to a tale set in the Viking era. ANALYSIS: "Sons of Thunder" takes off where "Blood Eye" ended and follows the band of adventurers led by Jarl Sigurd and containing our narrator, Odin-marked Raven, as well as several unlikely companions including an English girl, a priest who has made his life-mission to convert Sigurd and Raven (and through them the fellowship), as well as a Christian English warrior. This time they make their way to the land of the Franks and to Charlemagne's court, visiting a muddy and still village-like Paris of 803 AD and the glittering Aix la Chapelle aka Aachen, capital of the new "Holy Roman Empire". On the way they have the usual adventures, great duels, cunning tricks, great banter and blood curling happenings, while the book keeps the "no putting down" breakneck pace of the first volume. Charlemagne makes a very impressive cameo appearance and the meeting between the emperor whose life mission is to convert "the pagans" by fire and sword if needed and the famous "heathen" Jarl is among the many high points of the novel. Skulking in the background, the real "wheelers and dealers" of the court, of whom the famous Alcuin is one of the highest placed, try and manage the things for the "public eye". "Sons of Thunders" has three main strengths and I talked a bit about the impressive "world-building" - or "recreation, if you prefer - above, but I cannot overemphasize how well that is done. Many period historical novels tend to gloss over the unpleasant experiences of life in the respective era, but here the descriptions are unflinching, sometimes very graphical, but they never feel exploitative. The characters and their constant banter are also well done and we have very distinct personalities emerging. Sigurd is impressive as the battle hardened warrior with a fearsome reputation, but even he has to "manage" his people, so he fights a dangerous duel on fair terms when he could easily have rigged the situation, while later he consults the "fellowship" in each major decision. From his humble beginnings, Raven is emerging too as an incipient "second in command", while the weight of being "Odin's favored" hangs on his shoulders, so he is the one who needs to devise the "impossible trick" when the situation looks desperate. The pace of the novel is unrelenting and you literally cannot put it down since you want to see what happens next and while the ending is at a reasonable point, I so wanted more... A strong A and the series is among the best adventure historical fiction today regardless of period. I'm definitliy getting this second book as well. Another book I am looking forward to is King of the Crags by Stephen Deas, is any of the FBC guys going to review that?